Little did Leonardo know what he had wrought with this little painting of his. 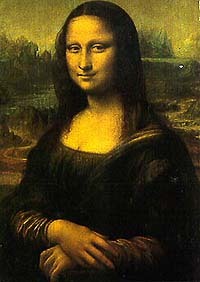 Who was this Mona woman? And what is she smirking about? We'll never know... Click on the pictures below to see a larger view. Frank, the man...it's eerie how close the resemblance is. It's her eyes and cheekbones, but it somehow seems to fit. A wonderful collage by Paul Giovanopoulos from 1988. Click here to go to site and investigate his other works. Here's an attempt to improve on the original by Marcel Duchamp done in 1919. You just can't pin this girl down... And of course our girl about town is internet ready and computer friendly. From one cereal box or another. Ho, ho ho. So, just who is she baiting with that mistletoe? Even the best of us can come down with a mean case of the sniffles. Mona and her little known sisters get in a round of "jacks or better" between sittings. Mona the tart ready for a night on the town. Or maybe even her own TV show. One of the scariest images I've found. I wonder if she would have just said no to Leonardo? And of course a cell phone is necessary when you're stuck posing for hours on end. How about callin' out for a pizza? Ever the party girl and always one for fun. All images are � their respective creators.